A couple of months ago, I was asked to make a portrait that a friend could give her husband for their wedding anniversary. It’s been a secret ever since then, but the anniversary was today and I have been given explicit permission to blog about it. Phew! Leo is a little boy. I’ve followed his progress since he was born. I consider his mum to be a good friend. I know a lot about her; she knows a lot about me. And yet, I’ve never actually met her, or Leo. Or his dad. Or their two cats. That’s because I know them in that peculiar modern way, through blogging and social networks. I’m quite comfortable with that sort of relationship: I have a lot of ‘virtual’ friends. I think lots of us do, these days: it’s certainly not considered as odd as it might have been ten years ago (I was remembering, the other day, how we used to call it “new media” – I suppose it couldn’t stay ‘new’ for long). Leo’s mum asked me if I’d create a portrait of him. Sourcing a photo was not much of a problem: there were plenty on Google+. Discussing ideas wasn’t hard, either. We did it through Facebook chat: in bed, in the supermarket, in the car – wherever we might be. And then, when I wanted to send her various options for how it would look, I was able to take a snap on my phone and send it through to her for instant comments – and it really was instant most of the time. This really does feel like a luxury of the modern age: imagine Michelangelo or Caravaggio sending a quick snap to a client, via his phone. I wonder whether the access to immediate feedback would have stifled them. Maybe – but in my case, it was all helpful. Leo’s mum liked the collages I’d been putting up on this blog, and she wondered if I could do something similar for this commission. 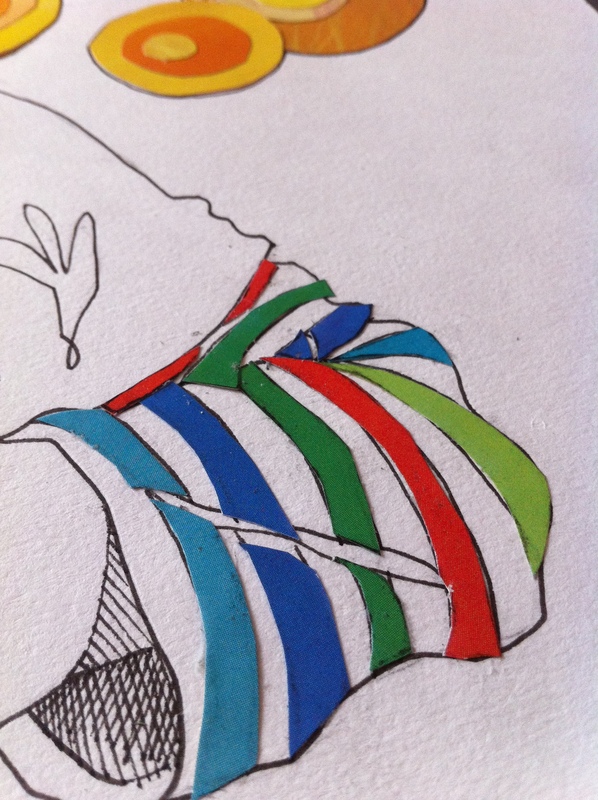 After a little thought I came up with an idea that she liked the sound of: a line drawing with collaged highlights. 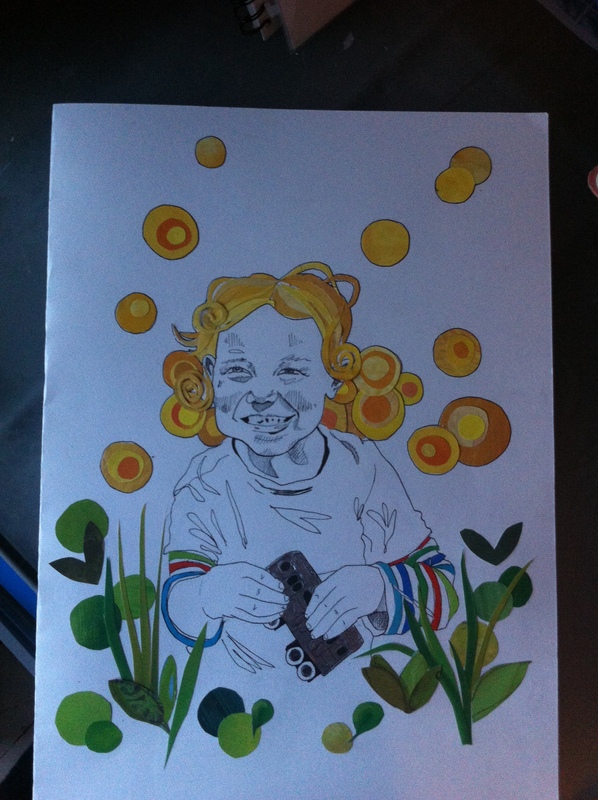 When I thought of Leo, I thought of his wild blond curls, so I wanted to make that into the main focus. I decided that the hair would be the collaged part. I wanted to use something apt for the collage material, so I suggested children’s picture books, which I’d source from charity shops. 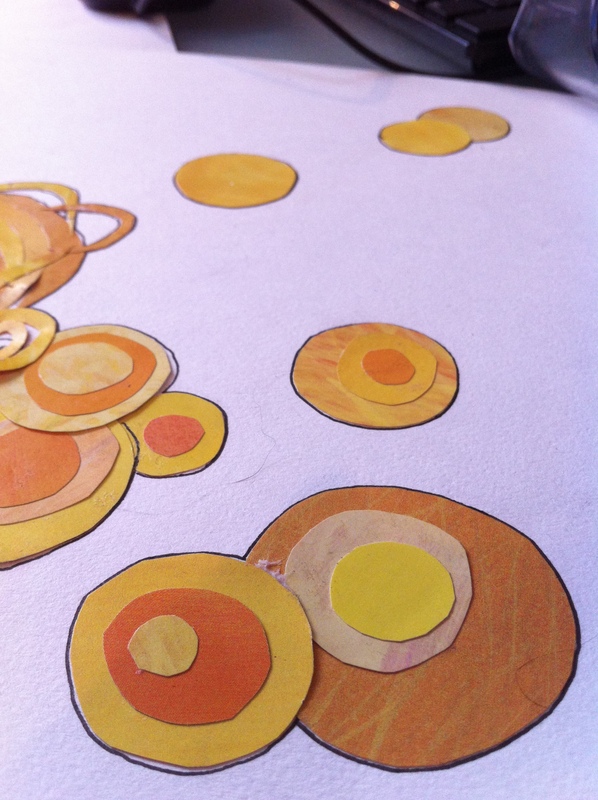 Originally I was intending to cut the paper into spirals, but once I started playing with shapes, the circles worked much better graphically; also, Leo had recently had a haircut, so the fact that some circles were floating away like bubbles on the wind seemed particularly appropriate. Later, a friend who dropped by while I was collaging asked what his name was, and pointed out that there’s also a great leonine look to the mane of hair. Once I’d done the image above, I sent a photo through. As well as the hair, there was Leo’s favourite silver Brio train, and I’d added stripes that were the same colour as an actual top of his. Leo’s mum liked it, but she felt she’d like the colour to be balanced out at the bottom of the picture as well as the top. This is where collage is great. While I wouldn’t especially like to paint six different options for approval, it’s so easy to cut out some different shapes and arrange them on the page to show what they’d look like. L-R, top – bottom: Stripes at the bottom of the t-shirt; Stripes in the background; Circles to balance out the hair circles; Circles plus foliage; Circles plus stripes; EVERYTHING together! In the end, we went for a version with foliage and circles, like the 4th version above, but a bit more spread out, as you can see. It was a really happy collaboration; modern technology made it easy for me to confer with my client, but there’s something more too: having instant feedback like this made sure that I created something a little bit better, and more balanced, than I would have if left to my own devices. Happy wedding anniversary, guys. May you have many more joyful years to come.